Note: Louise is soldiering on while Cathy is on Sabbatical. She will return February, 2018. A shy person who became overwhelmed by her sudden fame, Ederle also suffered from hearing loss from a bout with measles as a child. She became totally deaf by age 22. Ederle died on November 30, 2003 at age 98. 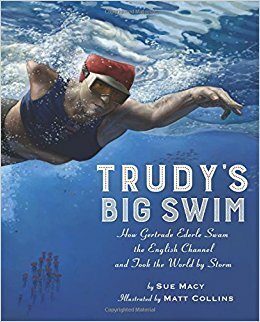 Macy’s informational picture book recounts the challenges Ederle faced during the swim. The writing perfectly matches the luscious, full-page, color illustrations by Matt Collins. Rendered in Prismacolor pencils, Denril Vellum, Painter 12 and Adobe Photoshop, will definitely keep young readers riveted to the page. Back matter: sources and resources + source notes. A very exciting reading experience for eyes and ears. Perfect to share in the classroom or snuggled up on a couch. Interesting to note. Macy states in her author’s note that many books will say Trudy was born in 1906, that she was only 19 when she was English Channel.” Actually, checking Ederle’s gravestone, Macy confirms Trudy's birth day was really October 23, 1905. That means she was 20 when she set the world's record in 1926.